Warped Tour 2015 would be my first Warped Tour in nearly six years. I wiggled my feet into my chucks and threw on my neon blue leopard dress. I glanced in the mirror and shrugged; I was as ready as I was ever going to be. After a two hour drive, I walked toward the PNC Pavilion. I could hear thrashing guitars in the distance. My energy was that of a teenager as the dust kicked up around my feet and the humidity brought sweat to my brow. After a quick check of my backpack and collecting my press pass, the Warped Tour world was my oyster. Two dollars bought me a map and schedule. It was time to map out who I would be able to realistically see. The main acts, not shockingly, were geared toward the end of the day, so I was in for the full-day experience. Out of sheer curiosity, I concluded I would check out Riff Raff, the outrageous rapper? I say “rapper” but even walking away from his set, I am still not entirely sure. “Who is ready to party with Riff Raff?” he screamed out to the crowd. Between his 80’s-inspired, viciously bright attire and the gentleman whose only function seemed to be carrying a Riff Raff flag across stage, I couldn’t help but been drawn to the whole spectacle of it all. Apparently Riff Raff was teaching me “How To Be The Man” over a Crazy Town “Butterfly” sample. Riff Raff, you so cray! I feel like that is something Riff Raff would say—through his gold plated grill, of course. I can’t say that I wasn’t down with some of the crazy, though. Koo Koo Kangaroo, the dance pop duo who normally play music for 3-year-olds, was my perfect stroke of weird. Their set was like Kindergarten all over again: hugging strangers, copying basic dance moves, screaming out your favorite color, playing with a huge rainbow parachute and coming to the conclusion that everyone around you is confident enough to put everything aside and act silly. A few musicians in the booth next to Koo Koo Kangroo rolled their eyes and muttered (pretty obviously may I add) that “This is Warped Tour,” while motioning to the line. 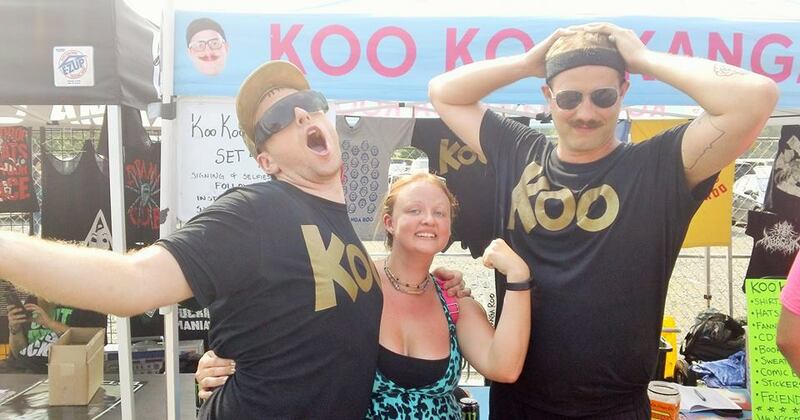 I was in that line and proudly admit that Koo Koo Kangaroo’s set was one of my favorites of the entire tour. The California g-punk weirdos New Band Fund were next on the stage and they killed it. Their daisy sunglasses and insane musicality impressed even the unknowing passerby. Their sound was a mix between Cage the Elephant and Beck, with a surf pop swing. After purchasing their album Sponge Fingerz, I must say I am a full-blown fan. It was obvious that the punk rock music festival I was accustomed to had, for better or worse, changed drastically. That is why when I made it to the Senses Fail show, I freaked out. Finally a little slice of how music used to be, even though 2002 doesn’t seem like that long ago to me. After losing my partner-in-crime in a mosh pit at the Senses Fail set and hiking back to the car, I sat exhausted in the leaned-back car set and charged my beyond-dead phone. Kicking my feet on the dash, I sighed, took a swig of hot water and silently commended myself for surviving.